"In 2000, Ernst Jorgensen and film archivist Rick Schmidlin got together to try and rectify the problems of Dennis Sanders' original 'Elvis That's The Way It Is' film. Out went all the interviews and hotel preparations. Even new opening credits were devised. New performances were edited into the flick and others cut. This was an act of remarkable hubris in that they were basically redirecting the film. They only half succeeded. While this is a far better, more coherent movie than Sanders', it still is not the definitive Elvis in Vegas record." -EIN contributor Harley Payette explores the two versions of Elvis' sensational documentary in this fascinating Spotlight. 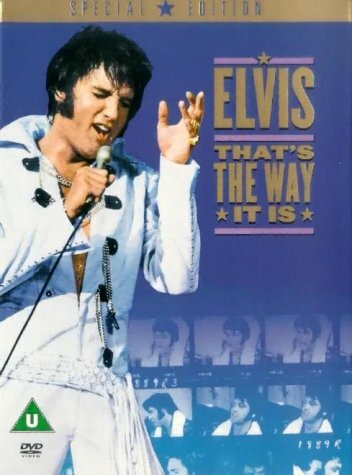 Way back at the beginning of time, my mother and I watched a repeat of the original "That's the Way It Is" on television. I was just a little kid, I couldn't have topped five years old but the movie was enough to start an infatuation with Elvis even then. The musical performances in this, Elvis' first documentary and 32nd film, are still strong enough to create fans in 2005. However, for all but a five-year-old kid the original film by Denis Sanders, an Academy Award winning documentarian, is problematic. Sanders' film is weird. Many fans have complained about Sanders' almost belittling interviews with occasionally off the rails Elvis fans. Even in their time, these interviews were quizzical and hurt the film not only because of the fan's weirdness but because of many of them having nothing to say or Sanders doesn't let them say it. For instance, the scene where the fan promises to write Sanders "a dirty little letter" if the film doesn't turn out right always leaves me scratching my head. Even worse these sidebars kill the momentum of Sanders' main thrust which is Elvis preparing for his August 1970 Vegas Season and the start of that season. Things go even further astray when Sanders interviews hotel employees who know next to nothing about their subject. The nadir of the film comes when Sanders pulls us away from riveting concert footage for ten minutes of a European fan club convention. He ended up with a film that is essential viewing for Elvis and non-Elvis fans alike because of the fact that it is a presentation of the greatest stage performer of the 20th Century at a performing peak. But other than Elvis' brilliance on stage, it doesn't make a coherent statement about its subject. You have no idea what Sanders makes of Elvis. On the one hand, Elvis is photographed well and Sanders use of zooming camera in and out is brilliant compliment to Elvis' performance on tracks like "Suspicious Minds" and "Polk Salad Annie". 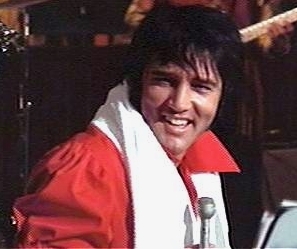 However, he also intercuts Elvis with chopping meat and asks a waitress if the crowds go crazy over Elvis' body. In 2001, Ernst Jorgensen and film archivist Rick Schmidlin got together to try and rectify the problems of Sanders' film. Using the MGM archives, Schmidlin with Jorgensen's guidance, went through the remnants of Sanders' original material and reedited the film. Out went all the interviews and hotel preparations. Even new opening credits were devised. New performances were edited into the flick and others cut. This was an act of remarkable hubris in that they were basically redirecting the film. It was also an act of cultural generosity as it attempted to restore the luster of an important moment in American Popular culture by giving Elvis' early Vegas work the documentation it deserved. They only half succeeded. While this is a far better, more coherent movie than Sanders', it still is not the definitive Elvis in Vegas record. 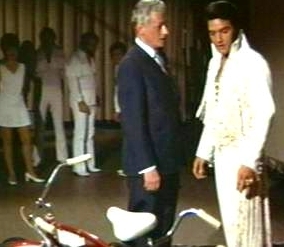 Schmidlin sticks with Elvis following him through rehearsals and on stage. Not stopping for interviews anywhere along the line except for Elvis' brief comments and introductions. We meet Elvis' sidemen through printed introductions inserted on the screen. Places and dates are identified in the same way. This makes Schmidlin's documentary much less conventional and more exciting then the Sanders' piece. Instead of a bunch of talking heads we are placed into a slice of life or more accurately a moment in history. Schmidlin though drops the ball when he gets to the concert. I'd say half of the Sanders' chosen songs are thrown in the dumpster and replaced with new but amazing as it is to say Sanders cobbled together a better show. What's more, the performances on some of the oldies particularly the big two "Hound Dog" and "Don't Be Cruel" are negligible. In person, I'm sure they were entertaining enough but they are just jokey toss offs. Their inclusion over the above mentioned performances reinforces the worst stereotypes about Elvis' work in this period, that he was just a parody of his former self. It also cuts off an important dimension of Elvis' stage show which was at its most contemporary at this point in time. This is not to say that there were no good performances of classics but the show is top heavy with them. Sanders found a way to balance the hits and the contemporary stuff. 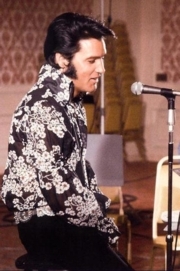 As he was aiming this at the general public, Schmidlin probably wanted as much recognizable "Elvis" material in the show as possible making Elvis - I guess- seem more like an original. His decision though wound up hurting his film. Schmidlin also made some questionable decisions in replacing some performances of songs with others. The most dodgy of these was including a version of "Suspicious Minds" with the lame "shove it up your nose" joke that Elvis used so often in later years instead of the straight version Sanders picked. In addition to the song selections, Schmidlin's show suffers from some awkard cuts and pacing at the beginning although it picks up greatly at the end. And Sanders, by choosing from fewer shows with similar costumes, better created the illusion of a single concert. In the end, Schmidlin's film is essential for the same reason Sanders' was- the utterly compelling subject. The rehearsal scenes in both movies are a treat but are more defined and informative in the Schmidlin cut. There are some wonderful bits as he shows "Twenty Days and Twenty Nights" coming together with great intercutting between Elvis running through the song with the band while the backing singers learn the track from his recording under Felton Jarvis' guidance. You really feel a part of the creative process. If you glance quickly enough during this segment you'll notice one of the Imperials bringing his head down and singing along with Elvis' "whoaa" on the record. A fan's piece of affection, it lets you know that even his back up singers could be scintillated by the man's singing. This is one of the things Schmidlin gives back to us because Sanders, whose mind was on who knows what, left it on the cutting room floor. 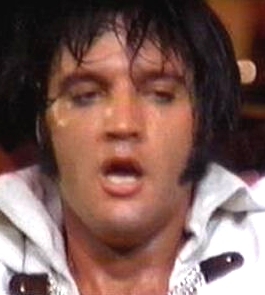 Elvis doesn't come off 100 positive in these rehearsal segments. On the one hand, you can see Elvis' intimate involvement in the music, how he doesn't just sing but LEADS the band directing the overall sound. In the "Bridge" rehearsals you can see him trying and experimenting to get at that sound in his head. On the other hand, he is hardly ever serious and many of his jokes are kid stuff. This was his third season after all and rehearsals were not a life and death deal anymore. And if all our private jokes were memoralized on a public record they'd probably come off fairly lame. Still, critics who expect their artists to be tortured might not be so forgiving. Like Sanders' movie though where Elvis really makes his statement is on stage. Even in this flawed presentation, Elvis' show comes off as one of the definitive concert experiences of the 1970s. And this represents the show at a kind of a peak. Sure, Elvis has lost a little of his fire since the two previous seasons. It was inevitable. Many of the oldies are just run throughs where in the original season they rocked. The lineup is not the radical revamp it was the previous February. It's also true that later on the show was more polished, professional and direct in its bang. In many ways though even these flaws make the show one of a kind, once in a lifetime experience. The show wasn't as radically new as it was six months or a year before, but it was a refinement and extension of what worked in those shows. And while the show got more refined in later years, it also got more predictable. As presented in the films of both Sanders and Schmidlin, this was one of the most unpredictable concert experiences of the century even if the entertainment value of that unpredictability is obfuscated 30 odd years later. For years, fans have been bewildered by Elvis' walk through the crowd in the Sanders' film. Schmidlin gives us a different walk and it indicates that it may have been part of that season. This was something that would have been unthinkable for Elvis in the 1950s but still must have stunned audiences of the time. Even within the show proper, nothing is predictable although in many ways the flow of the show is planned and what works one night can be recycled the next. Elvis engages in monologues, plays with tiny guitars, breaks up the backing singers, makes good jokes and bad ones. He might sing "All Shook Up" like he's seen the first horsemen of the Apocalypse a few moments after him sending himself up on "One Night" and the next night change it up. He might mock the overwraught sentimentality of "You Don't Have to Say You Love Me" or decide to rip your heart out with the same song. Camile Paglia commented once that the American concert experience would never return to life if performers didn't find some of Elvis' spontaneity. This captures a lot of what she was talking about. It also helps us understand why Jon Landau saw Elvis as a master of musical comedy on stage. That spontaneity works so well though because what Elvis managed to capture within a show that was brilliantly crafted. Without the punch devised by the rest of the show this stuff would seem self-indulgent at best. With it, it's an unforgettable experience. This show is crafted with intense precision with an emphasis on both the visual and the aural. 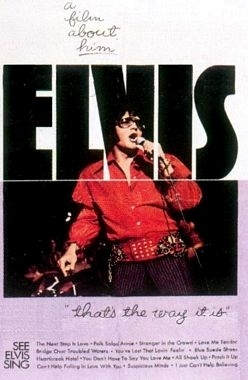 In many ways, Elvis' visual presentation was radical at that time. While acts like the Who and Jimi Hendrix used Elvis' swinging hips as a springboard to a more elaborate presentation of pop music upon the stage with lighting and theatrics, the 1969/1970 Elvis used their lead to up the ante with a sense of polish. And if it was a step beyond the usual rock show of the time, it must have made everything else on the Vegas strip seem like last week's papers by comparison. Detractors have complained about Elvis' posturing on stage here. Every move, every pose though serves a purpose tied to some musical emphasis point in the song. For example, Elvis gives us the desolate paranoia in the first verse of "You've Lost That Loving Feeling" with his back to the audience. (An alleged show biz no no.) Elvis is in spotlight with the rest of the stage completely dark. This all makes the first chorus of the song that much more powerful when Elvis turns around to sing it in on a suddenly fully lit stage. Elvis is providing us with emotional enlightenment. You can't say enough about the lighting effects in the show by the way. They also emphasize the movement and tone of the song. The work is further emphasized by the extra detail available on DVD. Elvis' stage movements provide the same kind of insight and excitement. At moments, like "Suspicious Minds" or the first chorus of "Loving Feeling" Elvis stomps and prowls on the stage. His movements throughout the show have a sinuous- often low key but occasionally overwhelming- sexuality about them. Unlike the 1950s, his arms and hands are his weapons of choice. Influenced but not dominated by karate they provide a sense of shock and violence on the up-tempo numbers and soul on the slow ones. No estimate of the physical power of this show would be complete without a mention of Elvis' dress and physical beauty. Thinner perhaps than he ever was, he is definitely more fit as his chest shows a form it didn't in his early '60 open shirt tri-fecta "Blue Hawaii", "Follow That Dream" and "Kid Galahad". Well tanned, he is probably at the pinnacle of male personal beauty and his outfits- low key karate style jumpsuits- capture that. More chic than gaudy, they set him apart not only from the tuxedoed Sinatras and Martins but also the rocker hoards. He is one of kind. None of this would work if the singer wasn't there and boy is he there. On a track like "Loving Feelin" his rhythmic phrasing using Ronnie Tutt's drums as his guide is among his most sublime. He outsings both Righteous Brothers with his inventive asides and subtle alteration of the melody. If his version does not eclipse the original (one of pop's few perfect records) it is only because of Phil Spector's ingenious production. It's still a thrilling reivention. Not that he needs to reinvent the wheel. He steals Tony Joe White's "Polk Salad Annie" without even changing anything important in the arrangement except an extended ending. His narrative is that much more authentic, his singing that much more fluid and that ending is great. The singer on display in these two numbers is not a parody. He is a relevant performer and consumate craftsman. His voice isn't as physically beautiful as it was in the early '60s when he could float at the top of his register, but it has ripened into a rich baritone. The sound he gives us here is like no other. Unlike say a Who show we get a little taste of everything within the pop spectrum. Ballads, swamp rock, protest music, country all of it done with conviction. Unlike later performances, Elvis still hasn't given up the ghost on rock and roll. Although some stuff is played for laughs, songs like "All Shook Up" still have power and life. At just about a minute, it doesn't work as well on record but on stage it provides rhythmic punch. 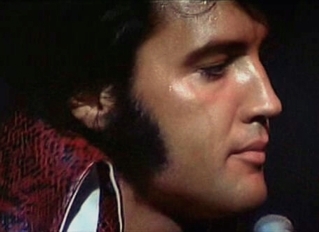 Those are 60 exciting seconds as Elvis maintains intensity throughout. The rough edge of the '50s is off his voice but he can still generate heat. That heat is intensified by the fact that the orchestra is still staying largely in the background on the rockers. Even the parodies serve a purpose. The broadness of his sound can also be heard in his musicians and singers most of whom are brilliant, all of whom are finely attuned to what he wants on stage. They come from various fields -contemporary rock Jerry Scheff, country Millie Kirkham, black and white gospel the Imperials and the Sweet Inspirations, rockabilly James Burton- and their sound shows it in a unique blend that matches their leader's taste and vision. All in all, the show that Elvis puts on here is a match for even today's extravaganzas. The big difference of course is that Elvis did all this and still found time to actually sing his songs. Plus, the level of spontaneity and originality here is too rare in these market driven days. Watching both Schmidlin's film and Sanders' you understand why this show blew people out of the water. You understand why a sophisticate like Cary Grant, hardly a member of Elvis' core audience, was moved to call Elvis "The Greatest performer since Jolson." That's why both movies remain essential viewing today. "I Just Can't Help Believin'"
"You Don't Have to Say You Love Me"
There are no run-throughs of "Polk Salad Annie" or "Stranger in the Crowd". There is a new rehearsal of "Santa Claus is Back in Town" and a new version of "You Don't Have to Say You Love Me". EIN Note - One fine day hopefully an updated 'TTWII Special Edition' DVD will be issued to include all of the missing material indicated above, along with unreleased material such as 'Stranger In The Crowd', 'Oh, Happy Day', 'Words', 'Something', 'The Next Step Is Love', 'Little Sister-Get Back', ' I Was The One', 'Love Me', 'Are You Lonesome Tonight?' plus plenty of rehearsal footage.